One of the most desireable things about fishing the Anvik, besides that fact that there’s not at all crowded, is the variety of fishing that can be enjoyed on this beautiful drainage. You can choose to drift fish from the boat, fish from the gravel shores of the Anvik or wade fish. Each day you fish with a different guide and different area of the river and its tributaries. Our accomplished guides each have their own techniques to help you catch more fish than you can imagine. We practice catch & release of the resident pike, char & grayling with the exception of shore lunches if you choose. We currently practice catch & release for sockeyes as well. Guests are allowed to keep male chum, king & silver salmon only and house limits are currently 1 king per person per day & 2 chum and silvers per person per day. All limits are subject to change per the State of Alaska regulations. 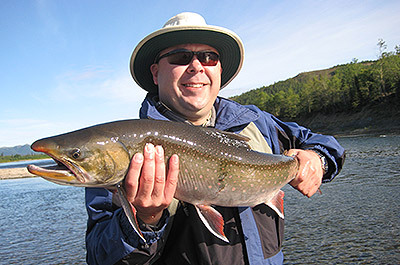 Whether you are a novice or a seasoned angler, fly-fisher or spin caster, you’ll have the time of your life reeling in Pacific Salmon, Northern Pike, Arctic Char, Dolly Varden, Arctic Grayling and White Fish all on the Anvik River. Your guide will take you by jet boat to the hottest fishing you can imagine. 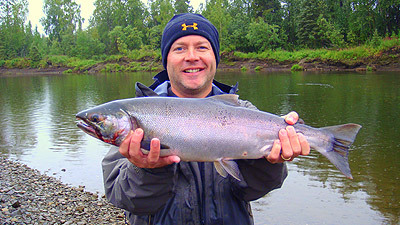 KETA OR CHUM SALMON – The Anvik River has the largest keta salmon run in the entire state. The average run count is between 500K & 650K. We’ve seen runs of up to 1M on the Anvik. These hearty Yukon River salmon certainly give you a run for your money especially on lite gear. Summer run keta average 7-9 lbs and are available the latter part of June until late July. The fall run keta are usually bigger fish at 8-12lbs. but lesser in numbers and can be found in the river mostly the month of August. CHINOOK OR KING SALMON – Yukon kings are the heartiest of the pacific salmon and average around 18 to 25 lbs. with many larger ones being caught in the 35 to 45 lb. range. These are an extremely hard fighting fish and you’ll certainly know it when you’ve got one on. It’s not uncommon to have to fight for close to an hour to land one. The typical Anvik king salmon is usually early July until early to mid August. 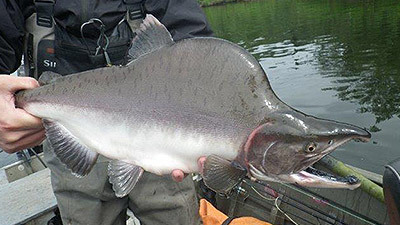 COHO OR SILVER SALMON – Known as the acrobats of the Anvik for their agility and strength. Averaging 8-12lbs and abundant in numbers available mid-August to late September. 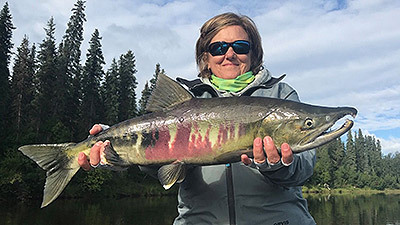 PINK SALMON OR HUMPIES – Returning to the Anvik on even numbered years only these are some crazy looking fish and a lot of fun to catch. We don’t keep pinks due to the lack of quality, but you’ll have a great time landing them. You’ll see them in the Anvik on even numbered years from early July to mid August. 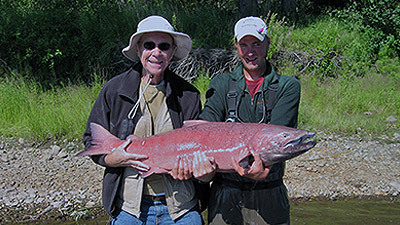 SOCKEYE OR RED SALMON – Sockeye are more commonly known for spawning in rivers with lakes at the headwaters. But up here on the Anvik, the Sockeye spawn in the smaller slack water sloughs. A fish of beauty, the Sockeye population is steadily growing in our local area allowing more opportunity for catching them each season. We currently practice catch & release for sockeyes as well. Guests are allowed to keep male chum, king & silver salmon only and house limits are currently 1 king per person per day & 2 chum and silvers per person per day. All limits are subject to change per the State of Alaska regulations. 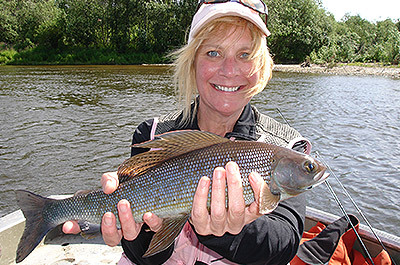 ARCTIC GRAYLING – the darlings of the Anvik River. Abundant and absolutely beautiful with there iridescent coloring and large dorsal sale like fins. Averaging from 14 to 20+ inches you can occupy yourself all day catching grayling either on ultra lite spinning gear or dry flies. They bite just about anything and are so much fun – ounce for ounce they’re the best fighting fish. Available all season. ARCTIC CHAR/DOLLY VARDEN – Since rainbows don’t travel this far north, these are an outstanding alternative and so beautiful. You’ll find an abundance of char during the early season, but they’re available all season long. 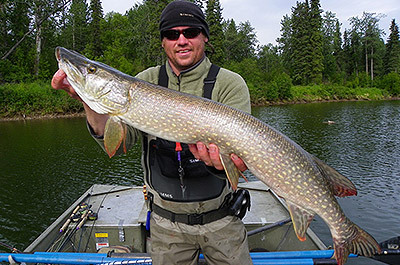 NORTHERN PIKE – The Yukon River and it’s tributaries are known for large aggressive pike and the Anvik is no exception. The river has many sloughs that hold the veracious northern pike. The ability to transition from fishing for grayling, to salmon to pike in just a few moments makes the Anvik an incredibly unique fishing experience. WHITE FISH – Often seen as a less than desirable species, it is a real sport fish. 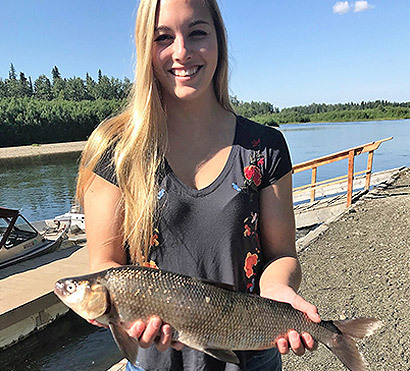 Although difficult to catch, the whitefish on the Anvik can reach up to 5lbs. and are delicious when smoked. "Over the years in my business I have had the privilege and opportunity to visit many fine hunting and fishing camps around the world. When I look back on our experience at the Anvik River Lodge I would have to rate it as one of the best I ever had in my life. I have never had people treat me nicer than here. From the fabulous meals to the extra effort of the guides. Every detail was attended to and our every need or desire was anticipated and looked after better than we could have dreamed." 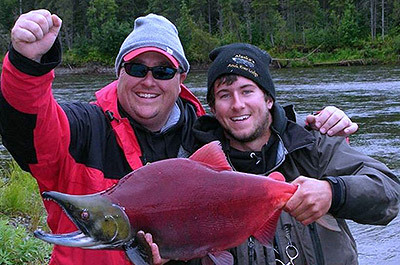 Here’s what Rene Limeres & Gunnar Pedersen have to say about the Anvik River - in their #1 Selling Book on Fishing Alaska, written by Alaska’s top guides, ALASKA FISHING THE ULTIMATE ANGLER’S GUIDE.